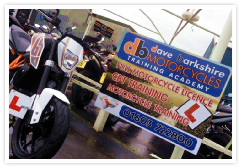 With many years of experience in motorbike riding, the Dave Barkshire staff members, in the shop and at the training centre, are able to offer you expert help and advice. Individual training prices are based on your experience; it is important to assess your ability as this training is on a 1 to 1 basis. Call 01603 722800 to chat to our training staff. 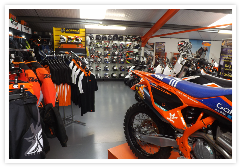 A generous discount is offered on all items of equipment purchased, should you opt to buy what you need for your CBT course from our well-stocked shop. This includes full instruction and hire of all necessary equipment. 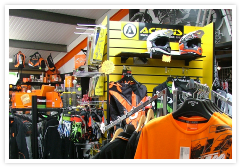 A generous discount is offered on all items of equipment purchased, should you opt to buy what you need for your CBT course from our well-stocked shop. The purpose of this course is to learn the correct machine control and bike craft, taught at our purpose-built training centre. This features an off-road course and test area that has been specially created to include road markings, roundabouts and some major and minor road junctions. This gives you a great opportunity to develop a good understanding of road situations, whilst learning in a safe, well-supervised environment. Completion of this course allows riders aged 16 to ride a 50cc moped or scooter and riders of 17 or above to ride a motorcycle of scooter of up to 125cc, however you will still not be allowed to take passengers or ride on motorways and 'L' plates must still be displayed. This includes full instruction and equipment hire. Our purpose-built centre provides all the facilities necessary to complete your training for Module 1 of the DAS Novice Course. It will enable you to build confidence and become competent to undergo that vital test. This is a four-hour, one-to-one training session, for those riders who want to return to biking after a break, aimed at refreshing both skills and confidence. The opportunity to ride on our off-road course, which represents general road conditions and situations, is a valuable way to refresh your skills. This is a two-hour course offering a full introduction to motorbikes, including controls and riding experience in a safe, supervised environment. Our purpose-built facility recreates all the aspects of public roads (markings, junctions, roundabouts etc) but without the possible hazards caused by other road users. Our expert instructors will give you the basic grounding that you need to get a taste of motorbiking. Why phone us for your individual training price? Individual prices are based on your experience; we feel that it is important to assess your ability as this training is on a 1 to 1 basis. Call 01603 722800 to chat to our training staff. Please note: If you are unsuccessful in any of your courses, a reduced rate will apply for retaking the training.